“Since the 30th April, I go almost daily to the hospitals,” Margaret Fuller told her friend Ralph Waldo Emerson in a letter on 10 June 1849. “Though I have suffered,–for I had no idea before how terrible gun-shot wounds and wound-fever are, I have taken pleasure, and great pleasure, in being with the men; there is scarcely one who is not moved by a noble spirit.” The noble men whom Fuller was attending were the Italians who had risen up in 1848 to declare an independent and democratic Rome. Under attack by French troops, they would soon see the fall of their new republic, as Giuseppe Garibaldi escaped Rome with his remaining troops and Giuseppe Mazzini fled into exile. 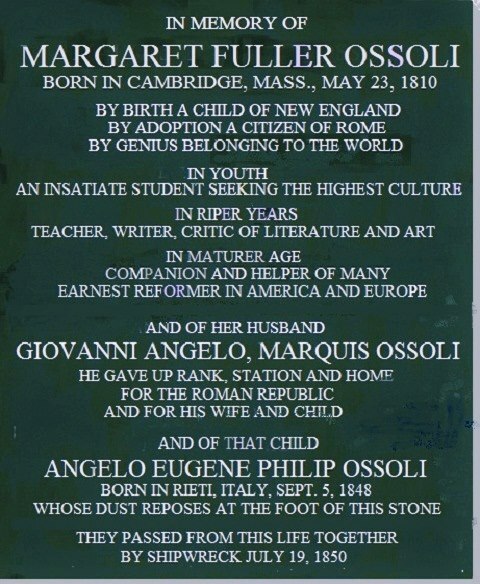 Fuller also escaped Rome with her husband Giovanni Angelo Ossoli and their infant son Angelino, only to die with her young family in a shipwreck on her return to America in 1850. Fuller never returned home, but she had nevertheless embraced Rome, and thus had found her true home, the city that seemed always to have been waiting for her. Fuller had met Italy’s great voice for independence, Mazzini, in London where she began a friendship and correspondence with him, regarding him the most compelling among the many thinkers and artists she met in her long-awaited tour of Europe. Mazzini was “not only one of the heroic, the courageous, and the faithful,” she wrote, “but also one of the wise.” The Italy that Fuller encountered when she arrived in 1847 was a society in turmoil, reaching desperately for the egalitarian values that Mazzini espoused. These same values, Fuller believed, were under threat in her own country. Looking at America from the vantage of Italy, she saw a nation cursed with the “horrible cancer of Slavery” and a “wicked War” with Mexico. “I listen to the same arguments against the emancipation of Italy, that are used against our blacks; the same arguments in favor of the spoliation of Poland as for the conquest of Mexico.” She urged her American readers to see Italy as a budding democracy, attempting to reconstruct itself on the principles that framed the American republic. Inscription of Margaret Fuller Memorial at Mount Auburn Cemetery, Cambridge, MA by Foersterin via Wikimedia Commons. Fuller is not often regarded as a democratic theorist, but her best-known work, Woman in the Nineteenth Century, is a profound application of democratic principles to the rights of women. She urged women and men to hasten the day “when inward and outward freedom for woman, as much as for man, shall be acknowledged as a right, not yielded as a concession.” Her case arose not only from her personal encounters with exclusion and discrimination, but also from her yearly series of public “Conversations” for women in Boston, one of the most innovative projects in the reform-minded transcendentalist movement. Fuller used her rising prominence as a literary prodigy—the leading American authority on Goethe—to establish a forum through which women could speak openly among a supportive community. To exchange ideas and impressions on history, literature, and mythology would stimulate, she believed, deeper self-awareness. Women would then ask, “What were we born to do? How shall we do it?” Those questions inevitably lead to discussions of equality. Taking these concerns to a new position as columnist for the New York Tribune in 1844, Fuller found a new America that both exhilarated and troubled her. She wrote on art and culture, but also tackled public issues that exposed the raw injustices and cruelties of the city. She condemned the New York’s shameful prisons, and insisted on the need for asylum reform and enlightened treatment of the mentally ill. Featured image credit: Margaret Fuller Portrait from the Library of Congress. Public domain via Wikimedia Commons. David M. Robinson is Professor of English and Director of the Center for the Humanities at Oregon State University. 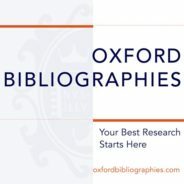 His research has focused on Ralph Waldo Emerson, Henry David Thoreau, and other authors connected with the Transcendentalist movement, and he is the author of the Oxford Bibliographies in American Literature article “Margaret Fuller”.